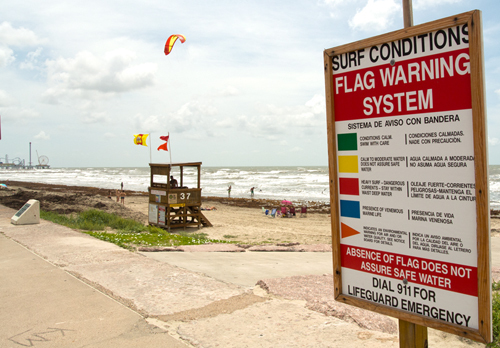 Red flags mean it’s time to find other things to do in Galveston, Texas. Now that you know everything, EVERYTHING, you need to know about fly fishing and fishing in general, in Galveston, Texas, let’s take a look at the social side of Galveston. You never know when you’re going to have a red flag day, or week, and if you are locked in to those dates at Galveston, you’re going to have to find more pleasurable things to do – like eat! As I pointed out, the case of “Hurricane Amnesia” seems to have completely taken hold of Galveston, even though there are still visible scars as you cruise up and down Sea Wall. Last month was the first time I have been to Galveston during the summer months, and I was a bit disoriented by the seasonal crowds there. We are talking busloads of students on pilgrimages … let’s just say crowds beyond measure. It was a far cry from visits during non-summer months in the past. However, if you find yourself in Galveston with the need to entertain, here are a couple of recommendations. The Pleasure Pier in Galveston, Texas, has short hours, but looks great at night – from a distance. For the kids, there’s the “Pleasure Pier.” I don’t recall that this amusement park was there before the hurricane, but it’s there now, and quite a sight at night – worth a look. 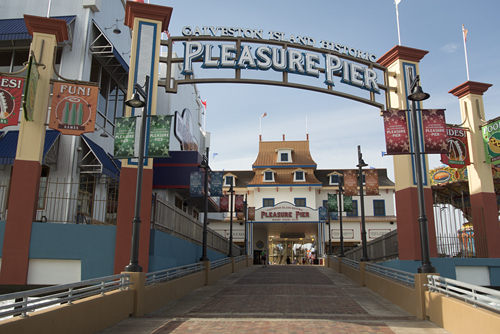 The Pleasure Pier has strangely short hours, so make sure to check out their information before dropping the kids off to spend their inheritance. Be sure to ask about the history of Casey’s-Gaido’s while you are there. I won’t spoil the story by telling it here. Two restaurants come immediately to mind in Galveston, and both are seafood joints. They seem to realize that good food translates into good business, and the level of traffic at Casey’s / Gaido’s tells you all you need to know – great menu, service and food. Go for the stuffed shrimp at Casey’s and upscale to Gaido’s if you need to impress. Another restaurant to dirty a fork at is Miller’s Landing on Seawall Boulevard. Boiled shrimp were fantastic according to my significant source, and be careful of the hushpuppies – they’re bigger than golf balls, so a full order feeds four easily. And they’re fantastic as well. For entertainment, there’s always fishing Bush Gardens and swimming – further down off the seawall the water gets significantly better, and the access is free. Overall, you really aren’t going to Galveston for it’s beautiful beaches and clean waves. The only surfing of significance, beside riding tanker waves in the ship channel, would be hurricane surf, and the last time I did that (at South Padre Island a couple of years back) it ended up in a ticket and fine.